The nurglii marine is more or less finished. 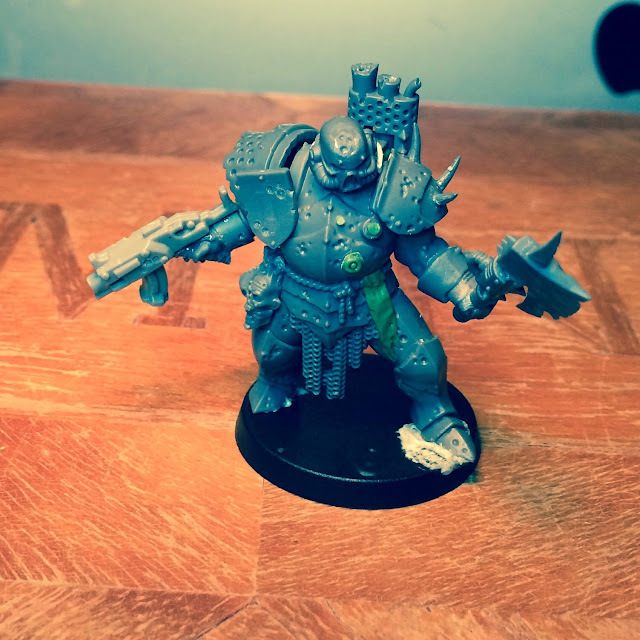 I'm really happy with the way he turned out - a very classic plaguemarine reminiscent of Jes's and Dave Andrews early 90's models. The old school bolter certainly helps to reinforce that image. If I may suggest something, I think it would look even better with some tubes or small vents (on the lower part aka legs) covering parts of the armor, or extra bolts, to kind of break the obvious fantasy origin of the mini. Maybe a grenade on the belt for a 90´s look. Cheers mate. I kinda like the legs as they are actually - don't really see the need to mess with them. A grenade or two is a good idea though! Very cool! I like the organic look of the armor in combination with the mechanical look of the backpack...awesome! However I would add something to the helmet, maybe one single spike/horn piercing through the sculpt on his right side (left on the picture), or maybe some bloated nurgle thingy...even though I like the idea better! 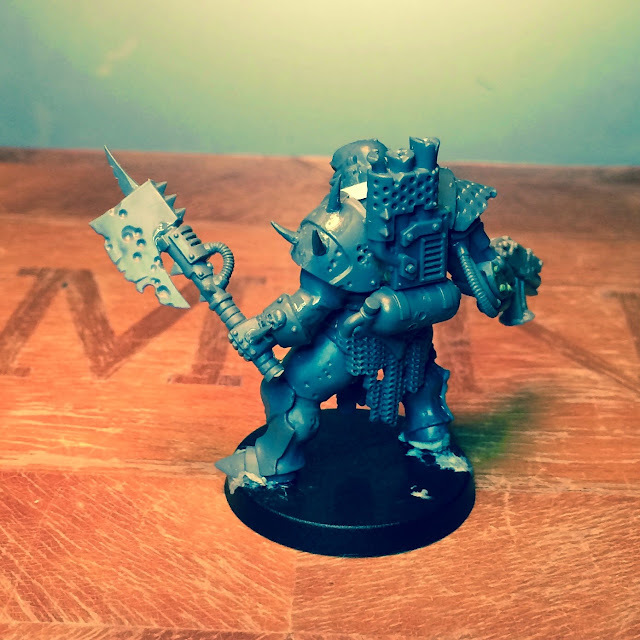 Very very good conversion-I can't wait to see him painted! I've actually tried adding horns/spikes to the helmet, but in the end the clean look always looked best so that's what I'm going with. Looking great! The old bolter with stock and the shield really finish him off nicely IMHO. Look forward to seeing the painted mini. P.S would love to see your take on a noise marine! Fantastic looking model! 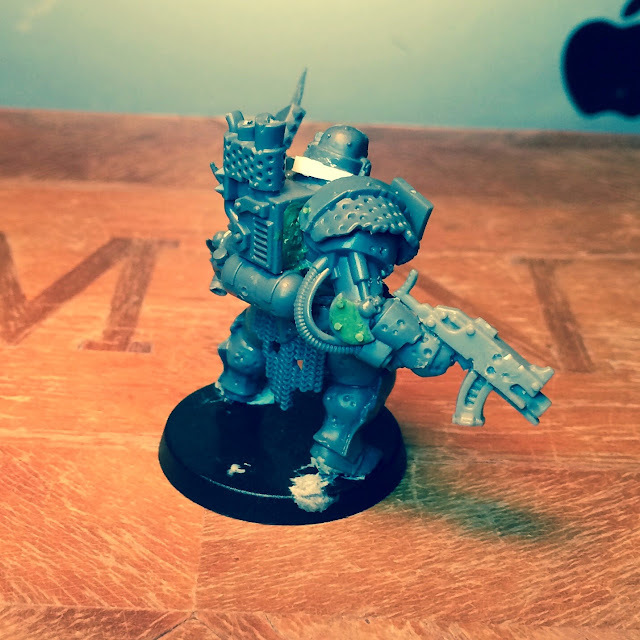 The old school bolter works perfectly! Thoughts about making the stock of the bolter wooden? A nice rotten looking wood would further reinforce the old Plague marine look. That might be more effort than it is worth (because it already looks great). Also, I am not sure I like the extra blade on the top of the axe head. It looks a little out of place and tacked on (also it is super crooked..which could have been by device...). I was actually thinking about a wooden stock, but other than sculpting it I don't see how it could be done. As you say the question is how much it would add to the mini. Perhaps it's worth it - I'll give it a good think. The blade is intentionally wonky but perhaps you're right - it just looks plain wonky. Good point. The backpack is from the flash gitz sprues right? Regardless, looks great and really brings the composition together. Great work! I agree with Adam Wier that you should drop the spike from the top, looks a bit too tacked on. However, if you want to keep the axe "spiky", you could put it on the back. 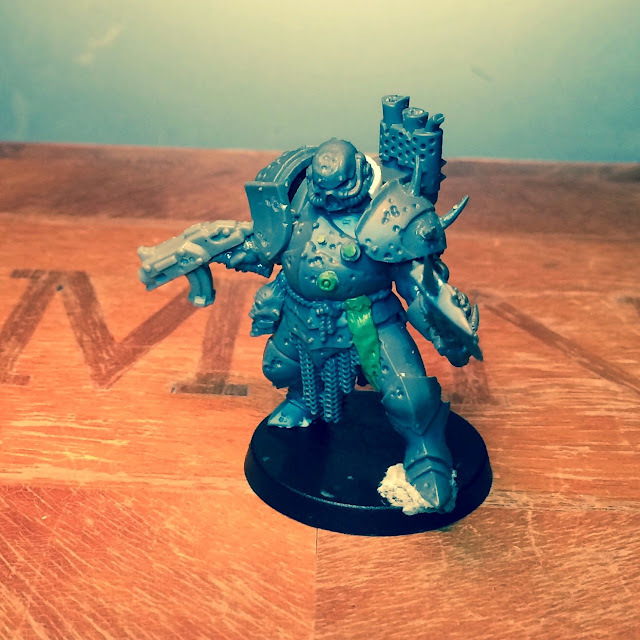 Are you going to go pre-heresy for the color scheme, or more of a modern rotten green? I've fixed the spike on the axe. Works better now methinks.